Symbolizes the call of the Father in these times, to awaken a world, which is abandoning His commandments. 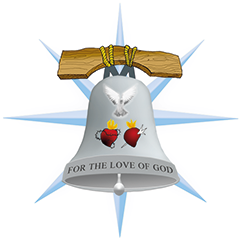 The morning star, that points to Jesus of Nazareth and to a ' light of a new Evangelization'. That joins together the wooden yoke of Christ and the bell, is Our Mother, Our Lady of Guadalupe. Represents the Holy Spirit descending upon the hearts of mankind. ”Symbolize Consecration; the first of the Four Cornerstones of the Mission. They also symbolize that the hearts of people today need to be touched and opened to God. “For the Love of God” is the core of the Mission and represents the first of the Ten Commandments.